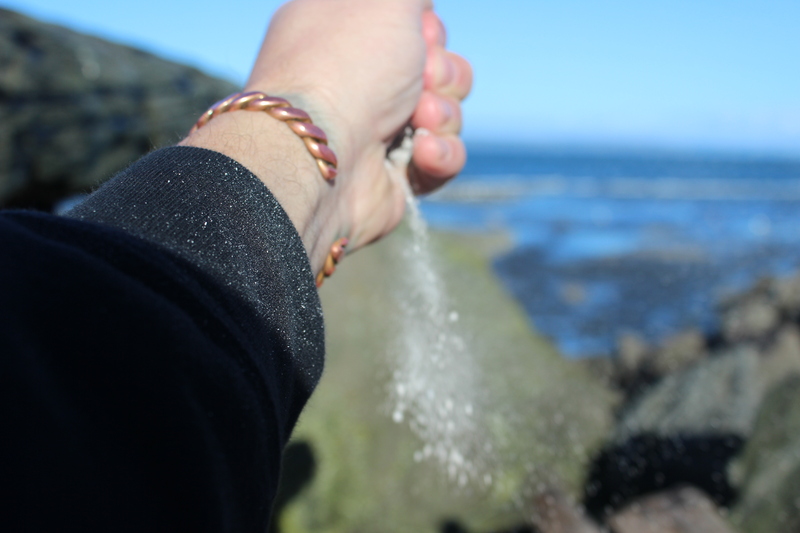 Salted Air Freedom | Can Bryan Write? We continued to discover and frequent gems of common interest. A favorite was a park, nearby. We became regulars to Salt Water State Park, a nice mile plus round trip walk from home. Here, the small public beach is choked by privately owned beaches, sea walls, rock cliffs, logs and rules. The semi-sandy beach is about forty yards by twenty at high tide. Currently it’s more than half covered by the naturally occurring, growing log pile gifted by storms and kept in place by law. In the summer months the tide recedes further and if lucky enough or planned you can carefully walk out another fifty yards or so on the Barnacle covered rocks amongst the tide pools. Here at an edge of the Puget Sound, where the ocean’s water works its way around the San Juan Islands, the small waves are more like swells. These tired waves sort of heave themselves, splashing, thudding and pounding against the rocks. Despite its shortcomings, Sarrah loved this place instantly. She would often insist on going there by taking a hard right, instead of the left turn on our usual daily trek down Marine View Drive. I am certain that my occasional “giving in” further fueled this action, but making time to enjoy small victories is good for all. We probably hoofed that all terrain trek at least five hundred times over the years, and around one hundred shorter versioned, driven in stops. Sarrah loved the Puget Sound, especially all of the creatures and smells that come with it. She happily stole bits of clam, crab and mussels from harassed crows and seagulls, who had dropped them onto the paved pathways to break them open. We walked the beach in search of sea glass (to collect) and sand dollars (to throw back), along the gurgling creek looking for fish, around the grounds and trails for less crowded nature. Sarrah seemed to have an affinity for salted air, in all of its forms: warm and strong, crisp and bright, cold and damp or even the bone soaking driven by wind. She led me to find and appreciate the less popular versions of marine air, which are highly addictive and ultimately better. On her last day here I carried her down to the beach, sat on a log and held her so she that could see the view and smell the air one more time. Saltwater Park was one of Sarrah’s favorite places to taste some freedom. This entry was posted in Sharing Gifts with Sarrah and tagged Air, Amended, Ashes, Beach, Discovery, Dogs, Freedom, Gifts, Memories, Moments, Pacific Northwest, Park, Puget Sound, Sand, Sea Glass, Walking, Washington, Waves, Weather. Bookmark the permalink. I like her choices it sounds like a great beach and I like the fact you took the time to do that with her, out of love. You were lucky to have and love each other. I know that love continues, nothing could take it away!